The Mauritius Commercial Bank (MCB) yesterday launched its Green Loan in Seychelles during a forum at the Eden Bleu hotel on Eden Island. The Green Loan, which is a SUNREF (Sustainable Use of Natural Resources and Energy Finance) programme developed by the Agence Française de Développement (AFD), will allow local businesses to boost growth by implementing green projects that will generate substantial savings while being kind to the environment. It also provides entrepreneurs with an exciting opportunity to infuse new energy into their operations, generate substantial savings and enhance efficiency while caring for the planet and future generations. SUNREF’s aim is to facilitate access to affordable green technologies, thereby guaranteeing the development of low environment footprint economy and contributing to the reduction of the causes of climate change and other environmental disturbances. This new credit facility has been developed by AFD and co-financed by the European Union (EU). The EU is contributing 1.7 million euros in the SUNREF Indian Ocean programme as part of the initiative Sustainable Indian Energy For All (SE4ALL), which is aimed at supporting the Seychelles government in the implementation of the national energy policy 2010-20130, in particular the 2030 objective of achieving 15% of energy demand met from renewable energies and also providing added value in the form of technical assistance to promote ‘green investment’. The loan can finance up to 100% of the value of the project. In return for their efforts to protect the environment, businesses will receive a cash back of 8% on the loan amount. 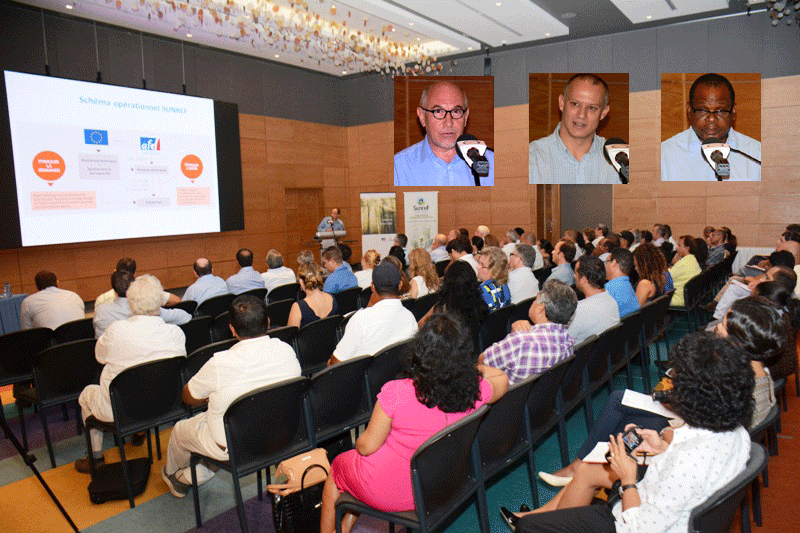 Present at the forum were the Minister for Finance, Trade and the Blue Economy Jean-Paul Adam; the Minister for Environment, Energy and Climate Change Didier Dogley; the French ambassador to Seychelles Lionel Majesté-Larrouy; dignitaries and stakeholders. Minister Adam thanked the Agence Française de Développement for facilitating this operation which has permitted the Seychelles to buy back its Paris Club debt by creating a fund which will be put at the disposal of Seychellois NGOs for biodiversity development, protection of marine resources, assisting artisanal fishermen and for the development of eco-tourism which forms an integral part of the Blue economy project. “This partnership that we are witnessing today also complements a number of other initiatives the Seychelles government has put forward,” said Minister Adam, citing the launch of the democratisation of photo-voltaic panels in different households and also its installations, as well as the free provision for the first month of solar panel for every entrepreneur who builds an ice plant for the fisheries industry. Minister Dogley said notwithstanding government’s enthusiasm for renewable energy, his ministry’s top priority is to explore new ways and means for our country to become more resource efficient. Minister Dogley added that the government has been working in partnership with other ministries, in particular the Ministry of Finance, Trade and the Blue Economy, renewable energy companies, the private sector, consumers, civil society and the banking sector in creating an enabling environment for the deployment of renewable energy and energy efficiency technologies. “Seychelles has always been an environmentally conscious country and this loan will give local businesses the opportunity to finance their growth and create jobs while ensuring the country remains an ecological benchmark,” said Bernard Jackson, managing director of MCB Seychelles. He added that the bank is confident that Seychelles can replicate the enormous success the Green Loan has had in other countries. As for Laurent Bergadaa, Chargé de Mission Agence Régionale pour Maurice et les Seychelles, Seychelles is a new frontier where the potential for energy efficiency and renewable energy is considered as significant. And that the private sector involvement could strengthen Seychelles commitments to combat climate change and achieve some real reduction in C02 emission. Ambassador Majesté-Larrouy called on all Seychellois entrepreneurs and enterprises to benefit from the initiative as it will reduce their electricity cost. He described the Green Loan as an initiative which will see to the emergence of a society more respectful towards the environment. Representatives of donor organisations like SUNREF and AFB delivered presentations on the role of their companies in the Green Loan in Seychelles project.